Delivery about 6-23 days to the USA, shipped by USPS from China with tracking ID. Pocket size. 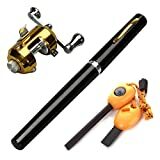 Great Gift.Portable, easy to handle.Great for fishing enthusiast or collectors.